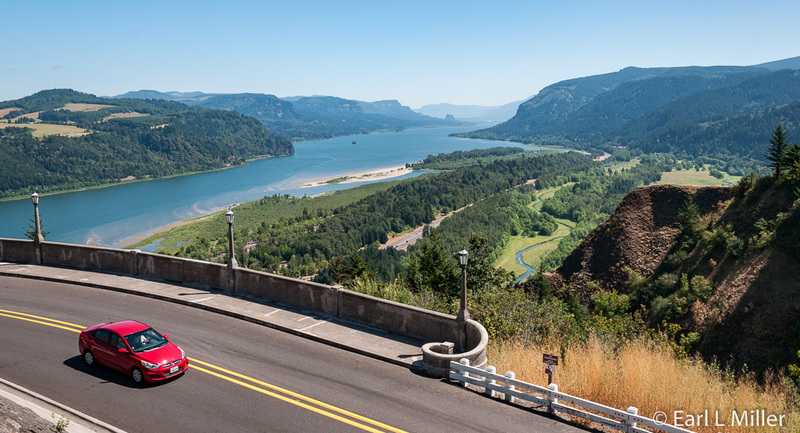 A drive along Route 30 at the Columbia Gorge is well worth the effort for the scenery you’ll see and some time spent at Bonneville Dam and Fish Hatchery. It’s dotted with a series of waterfalls, many within easy walking distance of parking lots. The two overlooks, Crown Vista Point and Portland Women’s Forum, provide commanding views of the river. 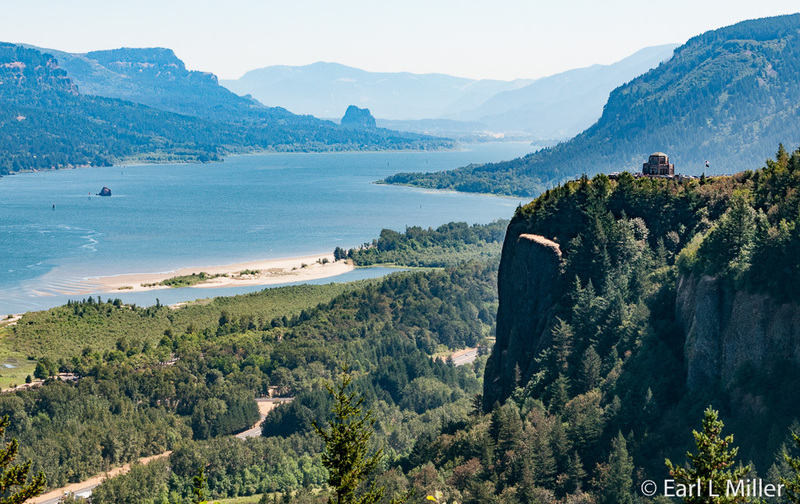 Located 9 miles east of Troutdale, you’ll find this overlook located along the Historic Columbia River Highway, Route 30. There is no fee to park here. 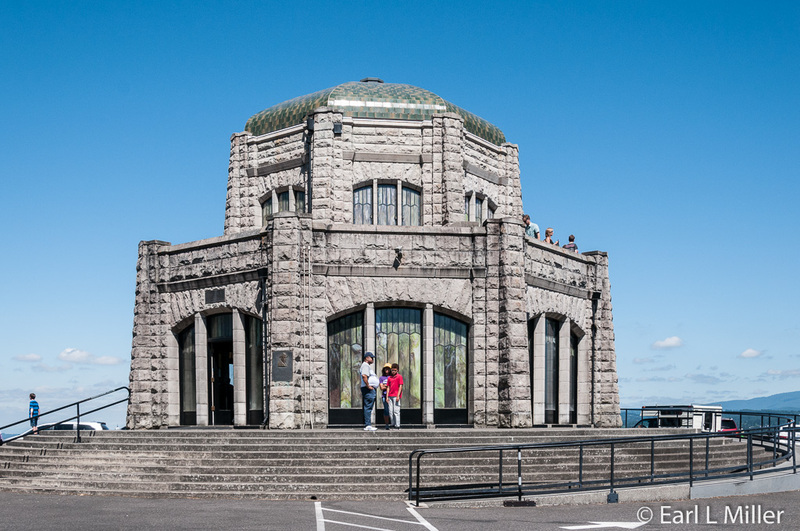 It’s one of the most photographed spots on your route with the Vista House and the wide expanse of the Columbia River in the background. Don’t be confused by the signs saying Chanticleer Point as that is its unofficial name. A plaque at the site describes the Forum’s support of this landmark. It was also the location of the Chanticleer Inn before it burned down in 1931. The inn’s restaurant had become known for its creamed chicken dinners. Your second stop should be the Crown Point Overlook, which stands 733 feet above the river. Shaped by the same natural forces which formed the Columbia River Gorge, it has been a state park property since 1938 and was designated a National Natural Landmark in 1971. You’ll find Vista House at this overlook. 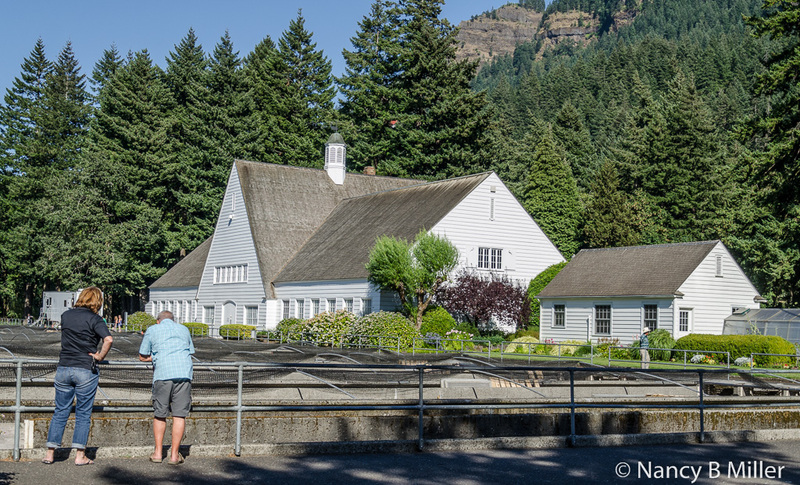 Designed as a rest stop observatory for travelers on the old Columbia River Gorge Highway, it’s also a memorial to Oregon’s pioneers, particularly those who made their way down the Columbia River. In 1974, it was listed on the National Register of Historic Places. Edgar Lazarus designed Visa House as an example of modern German Architecture. The two-story structure is 44 feet in diameter and 55 feet high. Its beauty is apparent in its gray sandstone, hexagonal shape; stained glass windows; and domed, green, ceramic tile roof. Native Italian craftsmen laid its foundation without using mortar or cement. Its construction started in 1916, the same year as the highway, and its dedication was May 5, 1918. It’s open 10:00 a.m. to 4:00 p.m. daily. Be sure to get out of your car and go inside the building to see its interior. Rare Tokeen Alaskan marble was used to surface the floors and rotunda’s stairs as well as used as wainscoting on the basement walls. The dome’s inside and its supporting ribs are painted to simulate bronze and marble. Just below the dome, on the walls, are busts of four unidentified Native Americans aligned so each mirrors its own likeness. You can either walk down the stairs or ask the ranger to send the hidden elevator. In the basement, you’ll see artifacts, photos, and interpretative displays about the highway’s construction, the gorge’s geology, and the historic sites along the route. It also houses the gift shop and snacks. One section of exhibits was on auto touring, roadhouses and restaurants, and auto camps. Sam Hill laid out the road in 1911-1912 to take travelers to the largest concentration of waterfalls in the world. There are more than 20 cascades along this highway. We learned that the area had the earliest campground in a national forest in the United States. It was at Eagle Creek in 1914. The early campgrounds had toilets and showers and sometimes small stores. Samuel C. Lancaster, engineer for the highway, operated a tented auto camp at Tanner Creek. It later became the town site of Bonneville, Oregon. While in the basement, walk down a few steps to the tunnel. 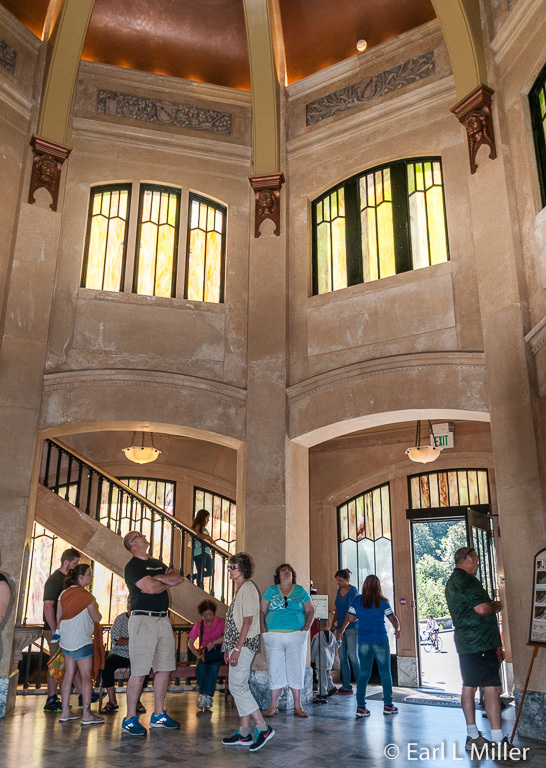 It contains photographs of Vista House between the period of 1912-2003 over the decades. 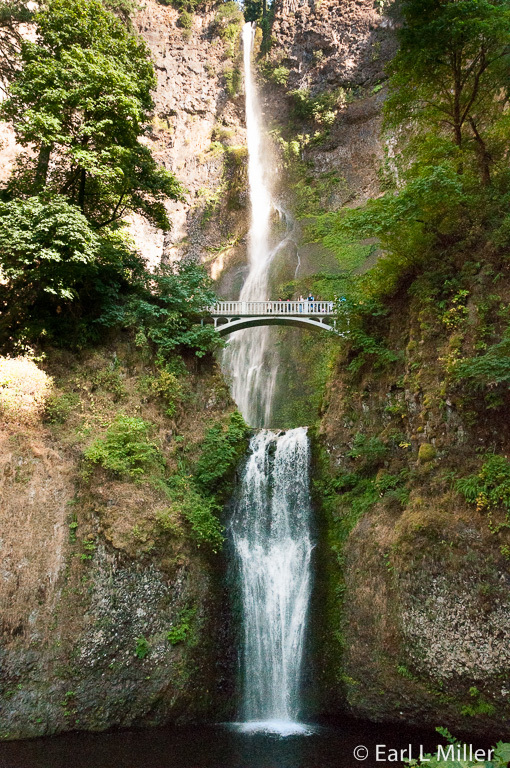 You’ll also see photos of Multnomah Falls over different time periods. The back of the tunnel has photos of the area before 1912 and massive photographic postcards of the past. 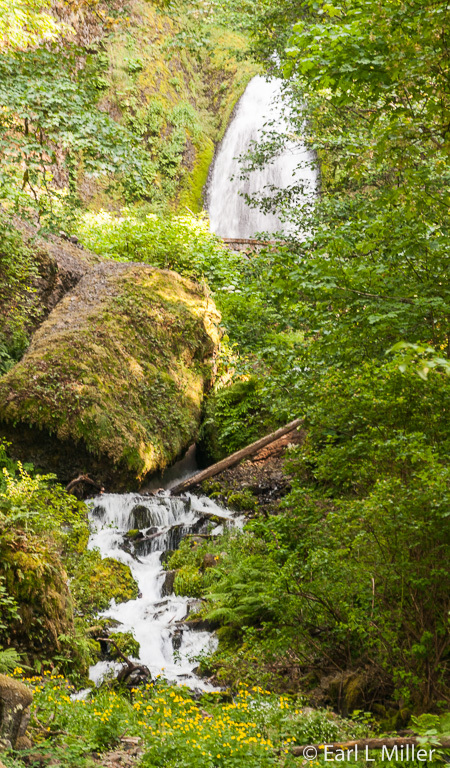 Located about 13 miles east of Troutdale, you will view several waterfalls you can see from the road and parking lot. The first is Wahkeena Falls tumbling 242-feet in a cascading type of falls with three plunging falls. A 0.2-mile hike from the parking lot at the base leads to the stone bridge that crosses the main part of the falls. You’ll find a picnic shelter with a stone fireplace situated at its base. Use of the shelter is on a first-come, first-served basis. It has picnic tables and fire rings. There is no fee to use it. You will come next to Horsetail Falls. The shape of the falls and the rounded rockface, over which it flows, cause it to resemble a horse's tail. It plunges 176 feet. 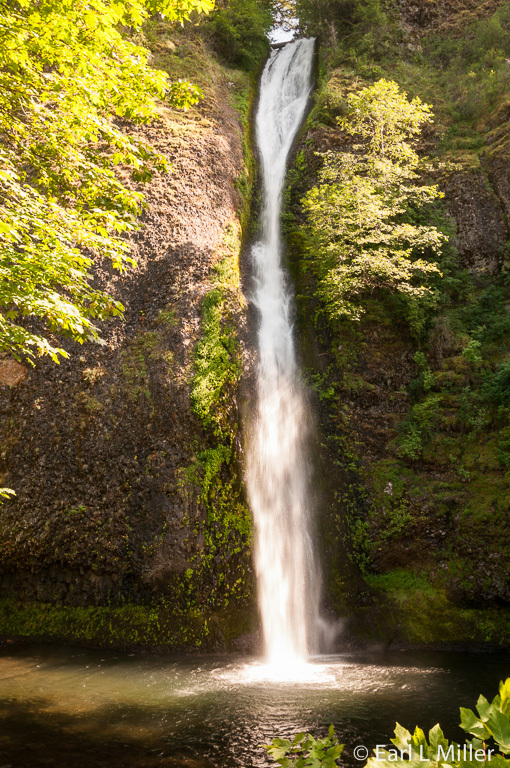 Those who enjoy hiking can take the trail to Upper Horsetail Falls. It's also named Ponytail Falls. There the trail leads behind the fall’s base. 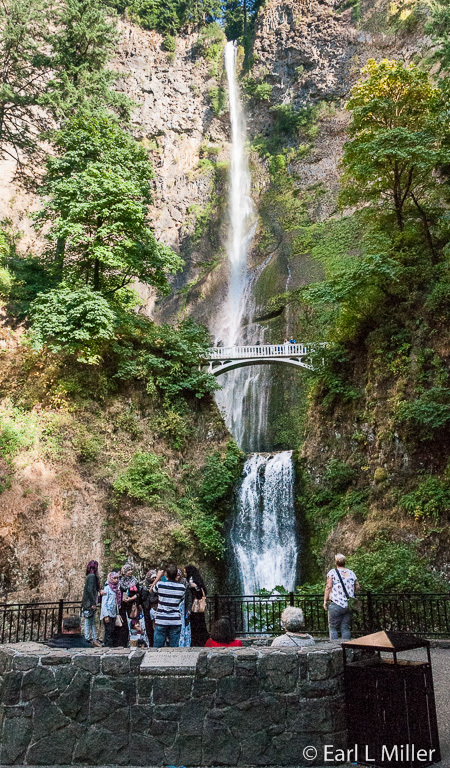 Thirty miles from Portland, Visitors find Multnomah Falls, Oregon’s number one natural attraction. After Niagara Falls, it is the second tallest year-round waterfall in our nation. It descends in two major drops. The upper falls plunge 542 feet while the lower falls I69 feet with a gradual 9 foot drop in elevation between the two. So the total drop is 620 feet. Its year-round source of water is underground springs originating from Larch Mountain. In the spring, snow melt greatly adds to the falls. You can see the waterfall from the road. 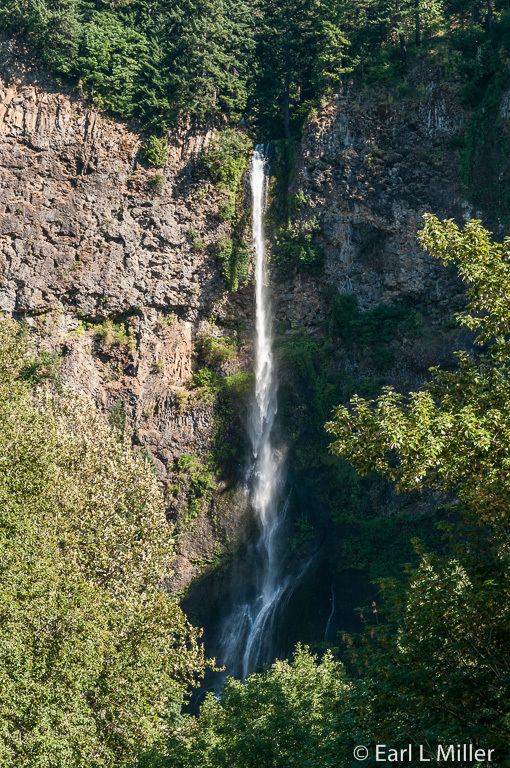 If you prefer, park at Multnomah Lodge and walk a short distance back to see the full majesty of these falls. Another option is to use the parking lot off of Interstate 84. The rest area and tunnel under the road allow Interstate travelers from either direction to stop and observe the falls. We found the best time for parking access is late afternoon. A bonus is that is also the best time for photography. Hikers should enjoy following the foot trail leading to Benson Footbridge. It's a 45-foot long footbridge allowing visitors to cross 105 feet above the lower falls and follow a paved trail to the viewing platform at the top. We didn’t do this, but reports I have read stated excellent views are available of the waterfall, Multnomah Falls Lodge, grounds, and the Columbia River Gorge from atop. 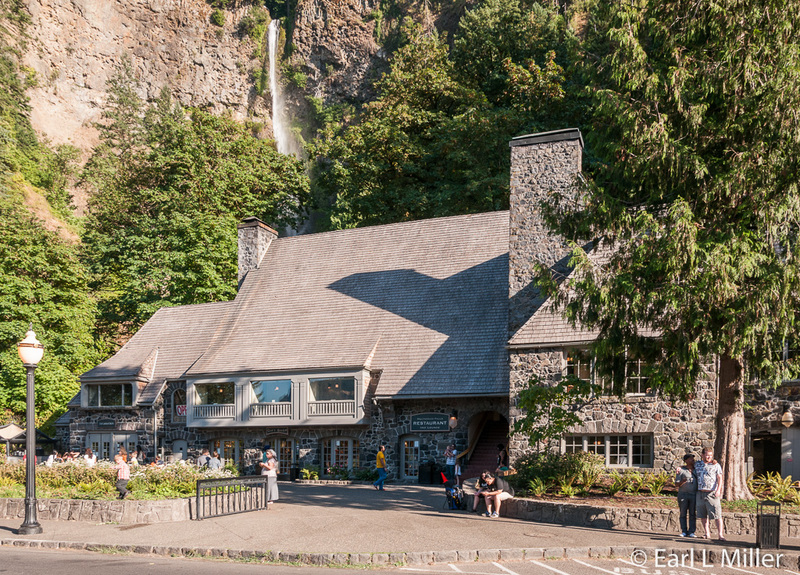 The Multnomah Falls Lodge, completed in 1925, houses a restaurant, gift shop, espresso bar, and U.S. Forest Service interpretative center. We spotted a snack bar on the side but didn’t try it for dinner as found prices quite high. The lodge is open 8:00 a.m. to 9:00 p.m. daily. For restaurant information and reservations, call (503) 695-2376. 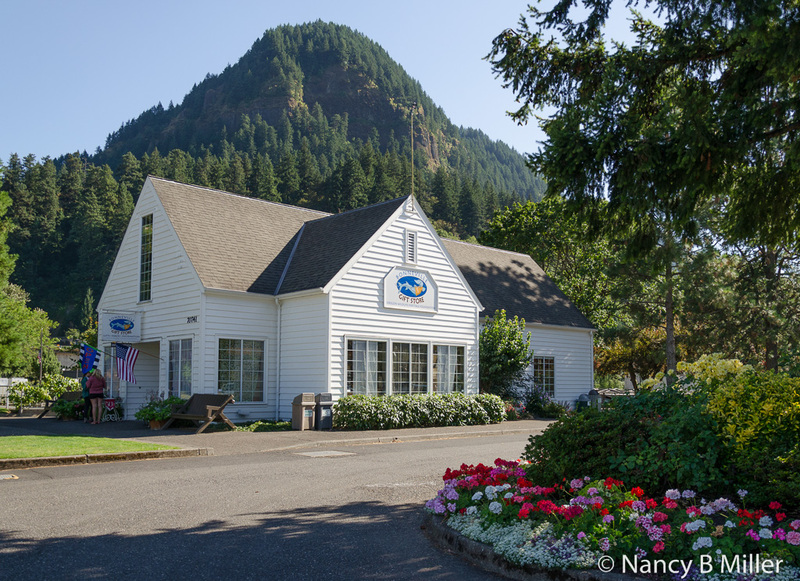 Forty miles east of Portland, you’ll arrive at the Bonneville Hatchery, one of the oldest in Oregon. Constructed in 1909, it was first named Central Hatchery because it served as a central hatching and rearing site for eggs from other hatcheries. It was remodeled and expanded in 1957 with another renovation in 1974. Bonneville Hatchery is Oregon Department of Fish and Wildlife’s largest hatchery facility. Its function is the adult collection, egg incubation and rearing of tule fall chinook; adult collection of fall chinook upriver brights; and adult collection and spawning of coho. It is also used for rearing summer steelhead, winter steelhead, and coho. The hatchery’s egg and fingerling facilities often assist other basin hatchery programs. 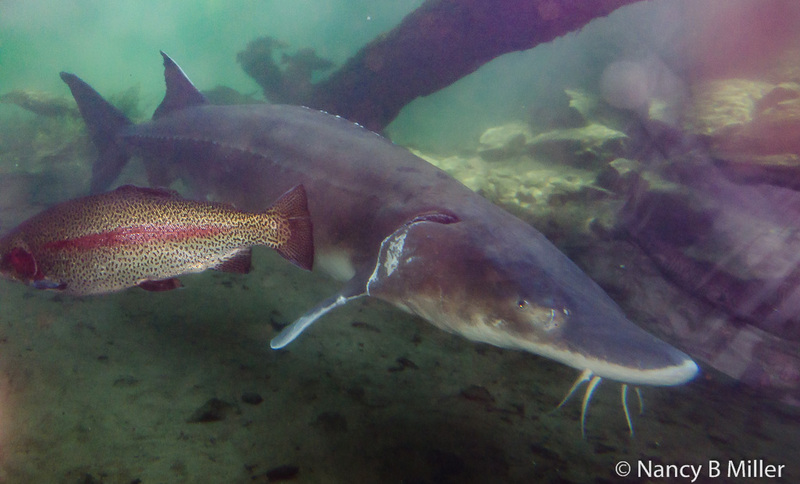 Two ponds have rainbow trout, which aren’t raised here, while another has some young sturgeon. Take time to watch the fish and feed them food available from machines for a quarter. 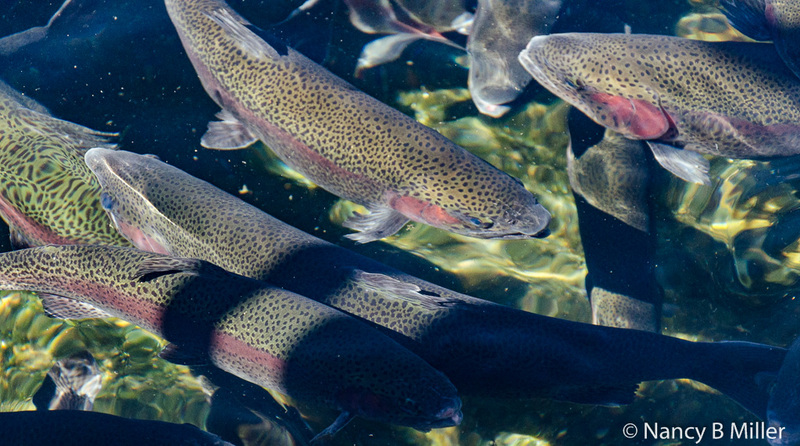 The best time to visit the hatchery to see chinook and coho salmon spawning is from late September to early December. You can see sturgeon and trout year round. I noticed numerous trout in the ponds when I visited in late July. Be sure to visit the Sturgeon Viewing Center building. You can view these fish from outside, but it is best to walk downstairs and view them underground. The largest sturgeon you’ll see is named Herman. The sign said he was ten feet long, 70 years old, and weighs 450 pounds. Several smaller ones, in with him, are named Hermanettes. The sturgeons came from the Columbia River when the government constructed the center in 1998. Sturgeons evolved from ancient groups of fish dating from 200 million years ago. While they don’t have scales, they have tough skin and rows of bony plates called scutes. These serve as armor. Under their snouts, they have four hard projections called barbels which help them feel their way along dark and murky river bottoms. Although classified as bony fish, their bodies are more cartilage than bones, similar to sharks or Pacific lampreys. White sturgeons are the largest freshwater species in North America. They can weigh a thousand pounds, grow to 20 feet long, and live more than one hundred years. A gift shop is also on the grounds. It’s the typical store with postcards, magnets, and other souvenirs. Located near it is a visitor center with exhibits. You enter that building from the rear and up a flight of stairs. This visitor center at Bonneville is a five-floor facility with lots to interest visitors. Before you enter, notice the turbine with the signboard. 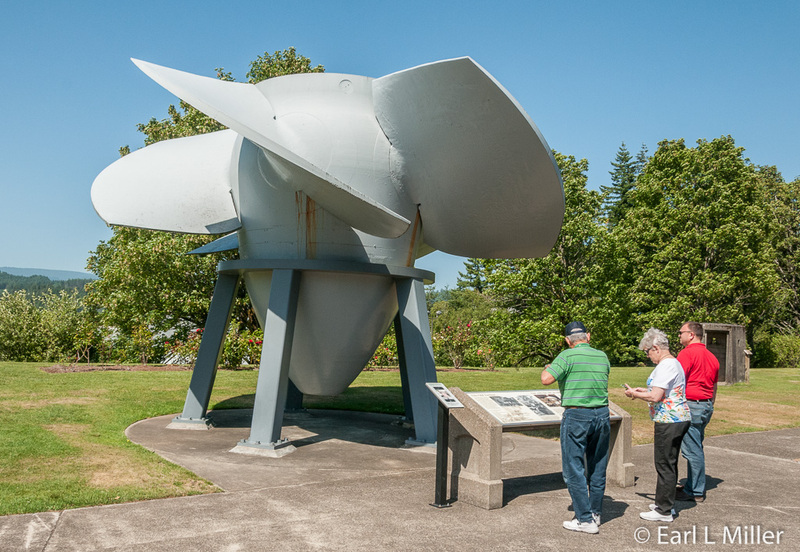 This was one of the original turbines removed from the dam. You can check out the fish exhibits and view migrating salmon moving through underwater fishways on the first floor. Go outside the building, on the third floor, to view fish ladders. 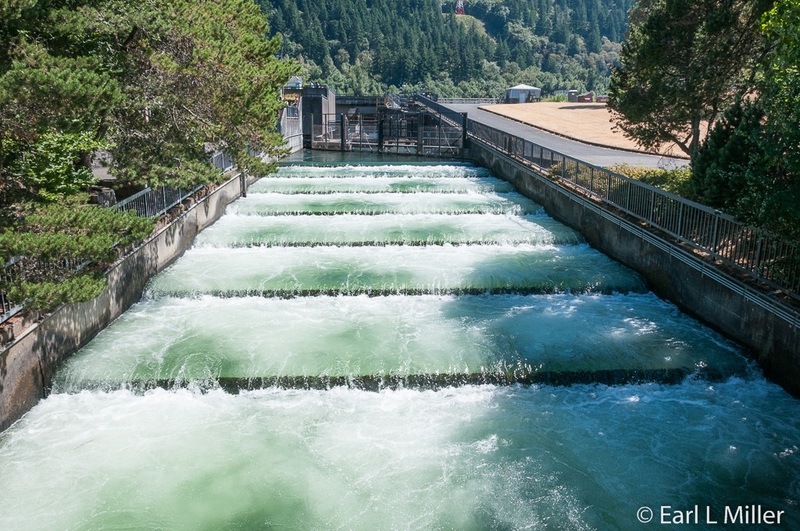 It’s via the fish ladders that salmon return from the sea to their birthplace to spawn. This floor also houses a theater about the dam’s history. The fourth floor is where you enter and the location of superb exhibits on Bonneville and the Columbia River. We headed first to the theater on the third floor to see a movie relating the history of Bonneville Dam and Lock. 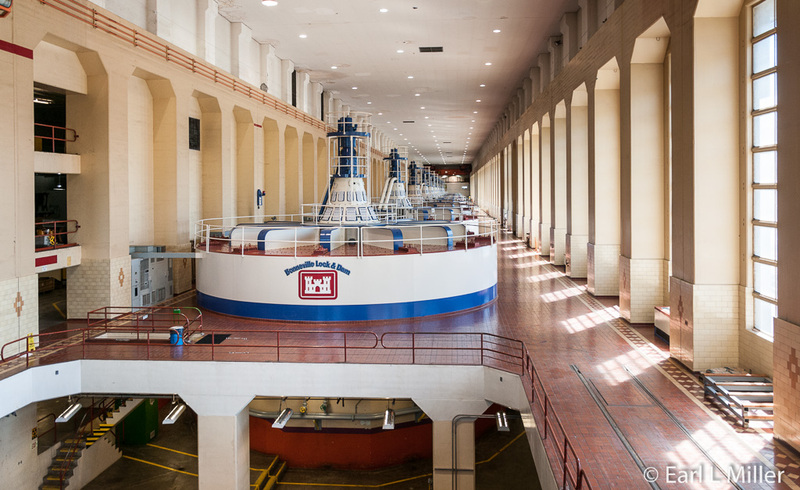 The first powerhouse was finished in 1938 after taking four years to build. It was to be the lowest dam in a proposed 10-dam chain. The reasons to build it were to furnish hydroelectric power, improve navigation, and provide immediate employment for Depression-era laborers and engineers. It consisted of two turbines originally. The belief at that time was that those would provide enough power indefinitely. The spillway, original navigation lock, and fish passage facilities comprised the rest of the project for a total cost of $83 million. A second powerhouse was finished in 1982, which added eight more turbines, as the 1938 prediction had long been proved incorrect. It provided an additional 558,000 kilowatts of electricity. New locks were constructed in 1993 increasing commercial traffic from ten to 30 million tons. The old locks, because of their small size, often caused delays in passage. It sometimes took as much as four hours to go through them. With the new locks, five barges and one tug could go through in 30 minutes. After watching the movie, we headed to the fourth floor. 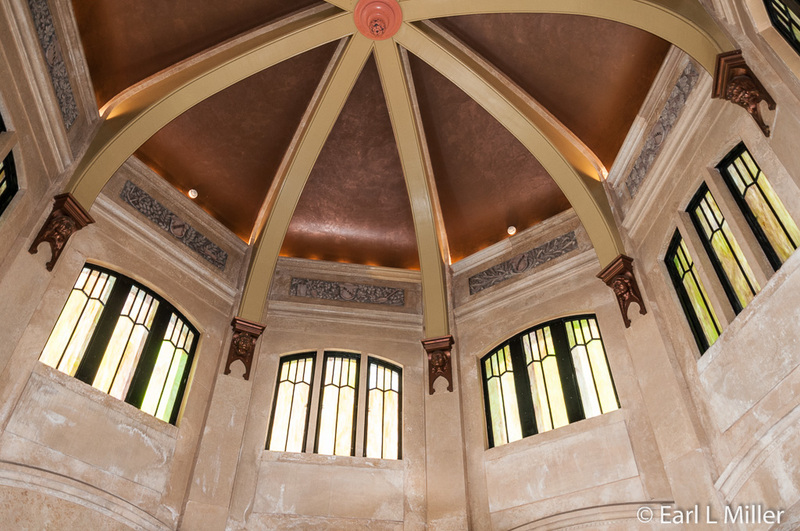 Tours of the old powerhouse are given by rangers at 11:00 a.m., 1:00 p.m. and 3:00 p.m. daily from mid June to September 2 and on Saturdays and Sundays the rest of the year. We were just in time for the 3:00 tour given by Bobby Trout of the U.S. Army Corps of Engineers. Trout gave a brief history of the dam and locks. She then discussed fish ladders as contrasted with elevators for the fish. It has been found that fish prefer the ladders. She mentioned how fish are counted. This is a process which occurs, among other places, at this visitor center. 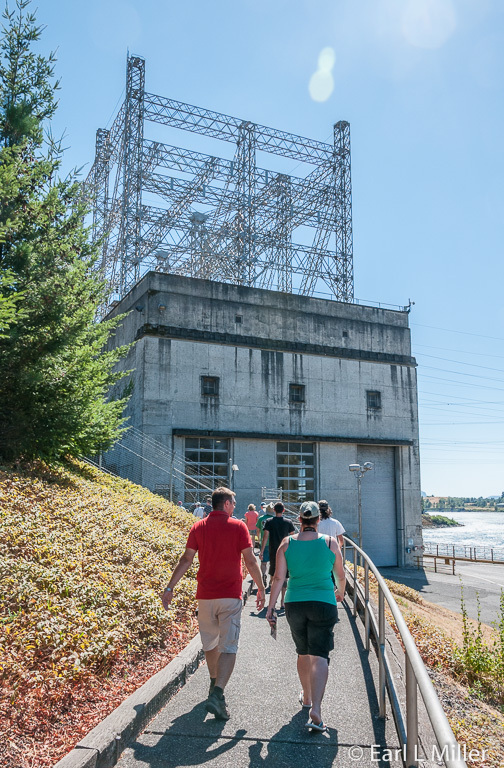 Step by step, she covered how hydroelectricity is generated at the dam before taking a group, including Earl, to see Powerhouse One and the fish ladders. I stayed back to tour exhibits on the fourth floor since the visitor center was closing at 5:00. Interesting displays were on the Columbia River. I learned it is the second largest drainage system in the continental United States, going through all or part of seven states. The river provides the world’s largest hydroelectric system, supplying three fourths of the region’s power and one half of the nation’s total hydroelectric power. Since the Bonneville Power Administration System sells hydropower at cost, this helps to keep the Pacific Northwest power rates among the lowest in the country. I also learned the Columbia River irrigates seven million acres in five northwestern states annually. More than 7-1/2 million tons of cargo pass through the Columbia River System in a year. Other displays discussed the dam’s history and parts. The spillway is a waterslide for salmon on their way to the ocean in spring and summer. It also keeps the area from flooding. Information on fish ladders and passageways was also given. Other exhibits were on fish and wildlife. I learned new technologies help native salmon and steelhead safely migrate to and from the ocean. Recent studies have shown that fish swim past dams as successfully as they swim through rivers without dams. Much of the revenue from hydroelectric power is used to restore spawning streams damaged long ago by resource development and other activities. Because of improved conditions, some wild fish are now returning to rivers and streams where they have been absent for decades. Extensive displays were on those who explored and settled the area. This ranged from the Native Americans to Lewis and Clark, the fur traders, and Benjamin Bonneville. The Native Americans held yearly trade fairs at the Oregon Dalles. On display are trade items used between the tribes and between the Native Americans and settlers. Pioneers also used the Native Americans as guides and boatmen to ferry and run them between the Columbia River rapids. Lewis and Clark camped near Branford Island before portaging their canoes around the cascades. Bonneville was noted for blazing portions of the Oregon Trail. He was a fur trapper, a Captain in the U.S. Army and graduate of West Point. Since Earl had now returned, we headed to the first floor. This is the place to observe chinook, sockeye, steelhead, coho, lampreys, and American shad through large viewing windows. We watched numerous fish swim past. 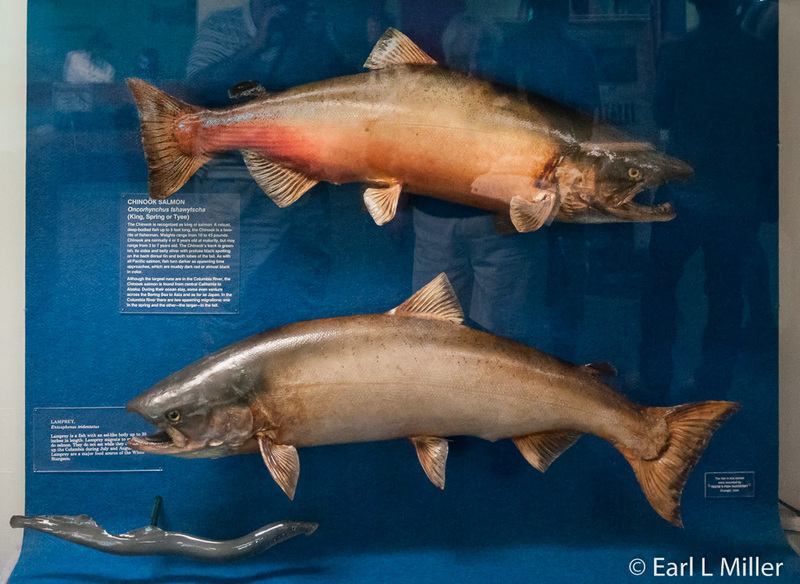 An exhibit shows lifesize models of these fish. Exhibits are on natural history and such topics as fish ladders. Fish spend two to 48 hours on ladders. Bonneville was one of the first dams to incorporate fish ladders in the dam’s construction. They attract fish by using currents since salmon have the instinct to swim into the currents. Other topics covered were commercial and sport fishing, Native American fishing, and foes of salmon including harbor seals, whales, and sharks. Others were how salmon grow at sea, the salmon life cycle, and the hatchery cycle. Bonneville Hatchery incubates up to 30 million eggs annually. After spawning, staff moves fertilized eggs to trays in an incubation room. Hatching can occur in as few as 50 days. Development rate depends on the water temperature flowing over them. After these fish, known as sac fry, hatch, they absorb the yolk and are now called fry. They instinctively swim upwards in search of food and are then moved to rearing ponds. Fall fry spend the winter and spring in outside ponds. Bright fall chinook are released after six months. They are now four inch fingerlings. Umatilla fall chinook and cohos are released after one year of rearing. By this time, they are six to eight inch smolts. Staff keeps nets over the ponds to protect the fingerlings from hungry birds. Coho are released directly from the ponds into a pipeline taking them to Tanner Creek and out into the Columbia River. Fall chinook go to Tanner Creek, the Umatilla River, or the Ringold Hatchery which is located on the Columbia River. Salmon hatch in fresh water then swim to the ocean where they grow and mature to adulthood. Chinook return when they are three to five years old and coho when they are three or four. They swim upriver to their stream or hatchery of origin to spawn where their life began. These are parents for the next generation. Each chinook carries about 4,500 eggs while cohos carry about 2,800 eggs. These are necessary for the species to exist because most of the young don’t survive the long journey to the ocean. Of every thousand juveniles that Bonneville releases, only three return as adults. That’s because of several reasons ranging from predators, dams that impede their travel, harmful river and shore environments, and human fisheries using them for food. All salmon die after spawning which completes their life cycle. 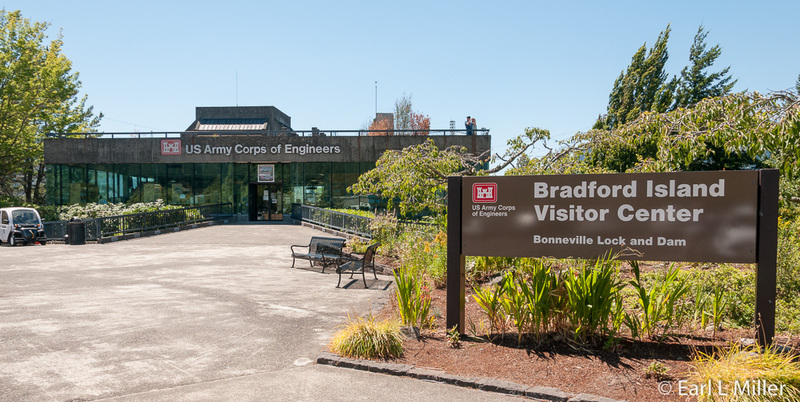 The visitor center is open daily from 9:00 a.m. to 5:00 p.m. For more information, call (541) 374-8820. Neither the visitor center nor the hatchery have admission fees.